Traditional Bengali embroidery is making a difference in many village women’s lives. The event named “The eye of the needle”, was hosted by the West Bengal Crafts Council last year, showcasing the innate artistry practiced all over the Bengali-speaking region. The unstated message was “crafted by women, strategised for economic freedom”. Traditional Bengali embroidery is making a difference in many village women’s lives. What was once a simple pastime, is increasingly done for financial rewards. It is empowering the artisans. Over his lifetime, octogenarian Ghazi Dewan (name changed) has had passports of four different countries: British India, India (post 1947), Pakistan (when he moved from Indian West Bengal to Pakistani East Bengal) and finally Bangladesh (when East Bengal became independent). It was the Bangladeshi passport that he used to travel to Kolkata to attend a brilliant exposition on kantha, a traditional handicraft. Women of all social strata did kantha work. One generation passed the expertise on to the next. It did not matter on which side of the border they lived. As the progeny picks up the threads from the forbears, the levels of sophistication increase. Kantha is the ubiquitous “running” stitch that is popular all over the world. 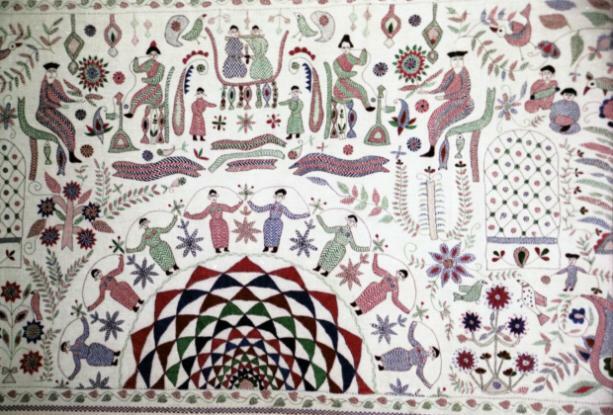 Over centuries, Bengali women have taken the kantha craft to levels of unimagined brilliance. It has held Ghazi Dewan in thrall since his youth. He used to watch the deft fingers of his mother and aunts as well as the hired help at home in Kolkata creating pieces of art. Today, kantha is a symbol of socio-economic emancipation. Bengal’s running stitch has eventually become a runaway success across the subcontinent and internationally. Designers as far away as Milan, Italy’s global fashion hub, now work with kantha practitioners. At their simplest level, kantha designs represent geometric grids. Nature-inspired designs are more difficult to create: popular images include pigeons, owls and parrots. Some artisans depict everyday activities and others opt for religious motives. Some images are inspired by famous poems. Typically, the pictures are framed by an intricately stitched border. The kantha tradition is shared by India and Bangladesh. It has been a veritable cultural imprimatur of Bengal for at least three centuries. Some historians trace the tradition back to ancient times. The craft is old but its appeal is modern. Kantha is ethnic and global, elementary and chic, simple and complex. Stella Kramrisch, the celebrated art historian who died in 1993, was fascinated by the embroidery. She wrote of “beauty out of chaos”. In each motif, she claimed to hear the voices of the craftswomen conveying their life stories. To anyone familiar with the socio-economic circumstances of Bengali villages, kantha is the storytelling of illiterate women who pour out their hearts on fabric. Some are too poor to purchase thread, so they use strands from old fabrics. Some sell kantha products to supplement their husbands’ incomes and feed their children adequately. In this sense, kantha is an example of environmental ethics in contemporary life. The artisans recycle and reuse old and torn fabrics. Their art does not require machines, fuel or electric power. It is carried out in the afternoon sunlight, after the day’s field and house work is done. As a source of women’s income, however, kantha is becoming ever more important in rural Bengal. On both sides of the border, women’s lives still tend to be tough. Many are married off early, often still as children. All too often, they are abused by their husbands and exploited by their in-laws. Many suffer malnutrition and even hunger. Innumerable women have turned to the kantha stitch to find some financial freedom and a sense of dignity. Today, there is a big market for their handicrafts. Some 60,000 kantha embroiderers are registered in West Bengal. Several thousands more do the same work without registration. Kantha embroidered clothing and accessories are now popular products; a range of objets d’art was born – from tea cosy covers to table mats. The craft firmly rooted in the culture, tradition and folklore is becoming the fabric of modern business, with urban sophistication increasingly informing the embroidery. The financial beneficiaries are all women. Kantha production remains a female preserve even in this evolving narrative. Two important changes are that women are getting a greater say in how their incomes are spent and that they are socially much more appreciated than they were in the past. Kantha is helping to redefine women’s roles in Bengali society. “Buy this piece,” exhorted Monimala Pramanik, presenting a unique piece that she has just completed at the exhibition in Kolkata, “will pay for my daughter’s college.” Monimala knows the value of her art and the value of education for daughters. That was virtually unheard of even a decade ago. The first person to appreciate the commercial potential of kantha was Rabindranath Tagore, the poet who won the 1913 Nobel Prize in Literature (see my other article). Later, Mahatma Gandhi made traditional handicrafts a symbol of the freedom struggle and wanted traditional skills to improve village livelihoods. After independence, Indian governments – both at the state and central levels – promoted handicrafts through training, financing and marketing support. In recent decades, urban purchasing power has allowed the market to grow fast, and small private entities have been closely involved in distributing and selling kantha. What was once a woman’s pastime is increasingly being done in pursuit of financial returns. The cultural practice of the older women training their progeny continues. The connection between the needle and the mind is as intimate as ever. Kantha’s timeless attraction had made Ghazi Dewan travel all the way to Kolkata to celebrate it. Indeed, the Jagriti Public School in a village in the Murshidabad District was set up by civil-society activists in 2005 and is still funded entirely with kantha money. This secondary school teaches about 700 girls, many from not-so-affluent families. Classes are held in English. The language of the former colonial power is important for professional careers but typically only taught after Hindi in government schools. The village used to be very traditional but today women move around on their own bicycles and even mopeds.